We are kicking off this Christmas season with an in-depth look at our most recent issue of Israel My Glory magazine that is all about “When God Became Man.” Steve Herzig stops by to talk about his article, “O Jewish Town of Bethlehem.” The town of Bethlehem is an important town to both the Jewish people and Christians and we’ll learn why that is. We’ll also learn what might be shocking to some, that this little town is now under Palestinian Authority’s control. What does that mean? Well, Steve will explain how revisionist history is happening in the very town Jesus was born. It’s a bizarre reality but something we need to be aware of. Chris Katulka: This Christmas season I want you to know that God hasn't forgotten you. He hasn't left you in the wilderness. Instead he wants you and me to know that his timing is just right. Steve Conover: This is The Friends of Israel Today. I'm Steve Conover and with me is our host and teacher Chris Katulka. Our episode today is dedicated to our most recent issue of Israel My Glory. Israel My Glory if you haven't heard of it is our award-winning magazine full of timely and insightful articles on trends that impact Israel, the Middle East and the Christian world and it's all from a biblical worldview. 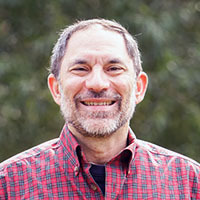 Steve Herzig, Director of North American Ministries here at the Friends of Israel Gospel Ministry, he'll join Chris to talk about his article concerning the current political and spiritual climate in Bethlehem. It's a timely topic for this season. Chris Katulka: I'm really excited to have Steve join us. 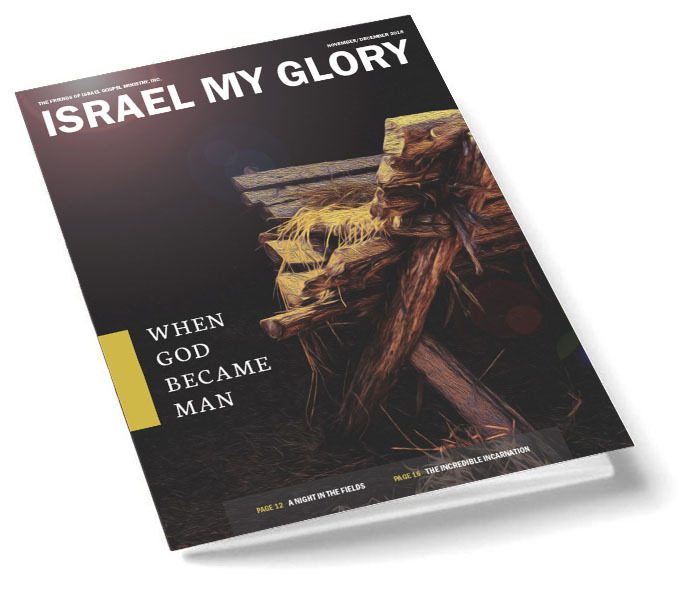 And after we're done our conversation I'm going to share with you some of my thoughts about our most recent issue of Israel My Glory which is all about when God became man. It's a Christmas issue for Israel My Glory. And I also want to remind you, our listeners, if you've never subscribed to our magazine I would encourage you to go to our website foiradio.org and it's right there where you can sign up and if you sign up and if you've never signed up before, this is your first time, you will receive a free six issues, that's one year of Israel My Glory that will come right to your house. I want to encourage you to go to foirradio.org and there you can subscribe to Israel My Glory. Steve Conover: We encourage you to do that. Thanks Chris. In the news Israeli Defense Minister Avigdor Lieberman resigned from his position after he announced he would step down in protest to Netanyahu's cease fire agreement with Hamas after the barrage of rockets that were launched into Israel a few weeks ago. Lieberman wants to see more military action in Gaza and less cease-fire agreements with the terror organization. Chris Katulka: Steve a couple of weeks ago when those rockets were coming over my cell phone kept buzzing, I have an app on my phone that lets me know every time a rocket gets launched into Israel and my phone was buzzing and I'm not exaggerating every two or three minutes it was buzzing. I almost felt as though I was there with Israel, it was a great way to pray for them during this time. But I can understand Lieberman's desire to be more hawkish in Gaza. He wants to make sure Gaza understands that what they're doing is wrong, Hamas what they're doing is wrong. But I actually lean more in Netanyahu's direction. I think a full scale war in Gaza will never work out in Israel's favor. Too many innocent Palestinian lives will be lost, too many innocent Israeli lives will be lost. And Israel always loses the media war. They'll always lose it. And so there are more effective ways to financially squeeze Hamas and to get the message out to the world that Israel is under attack. Today is our Israel My Glory in depth day. And we're looking at our most recent issue of Israel My Glory and it's really our Christmas issue. I always enjoy our Christmas issue. And in studio with me is Steve Herzig, a colleague and dear friend. Steve is the Director of North American Ministry. Steve, great to have you. Steve Herzig: I might also add Chris, by the way great to be with you, but your boss as well. Chris Katulka: That's right. You are my boss. A very awesome boss at that. Steve you and I we were talking a couple of months ago about the fact that you found out some interesting information. Our headquarters is near Philadelphia. And you found out some interesting information about a church in Philadelphia and how it plays into really a song that we sing pretty often during Christmas. Can you share little about that? Steve Herzig: I sure will Chris. I was with my wife and we went to a restaurant, one that we liked downtown. And my wife who helps me check out the text when I'm writing, she proofreads for me and told me that the restaurant we were sitting in, right across the street was a Church of the Holy Trinity located right on Rittenhouse Square and I had just written an article, O Jewish Town of Bethlehem in which Phillips Brooks visited Bethlehem and he was the rector of that church. So we got an opportunity after we ate to go and walk around the church. It was amazing to think that he's traveled all the way to Bethlehem just to serve at a specific Christmas Eve service for that time. That's a remarkable thing. Chris Katulka: And didn't he write the song O Little Town of Bethlehem as well? Steve Herzig: That's exactly what he wrote. And so that's why I wanted to emphasize Oh Jewish Town of Bethlehem. Chris Katulka: And you do that on purpose because Bethlehem has been in a flux over the years. But first before we get to that flux, before we talk about where Bethlehem is today spiritually and politically let's talk about the history just really briefly of Bethlehem, biblically. Can you share a little bit about the history of Bethlehem, biblically? Steve Herzig: Well, Chris for me personally, because of my background, little did I know in my Jewish scriptures in Micah Chapter Five and Verse 2 was a verse concerning Bethlehem that specifically the south of Bethlehem which was in comparison to Bethlehem north. So specifically Micah is saying that there is going to be someone born there. Prophetically speaking that verse helped me come to know Jesus Christ. Steve Herzig: Absolutely. I got it right out of my Jewish scriptures which were given to me at my bar mitzvah. I had never read that verse either that I know of in Hebrew or in English. But when the presentation of the Gospel came to me, part of that presentation in addition to like Isaiah 53 and Isaiah 76 was this very passage in Micah Chapter Five, the exact location of the Messiah's birth. Chris Katulka: Personally I think God chose that location for a reason, Micah 5:2. because you have to go back even further into biblical history, Jewish history. There was somebody very important that was born in Bethlehem before Micah had made that prophecy. Steve Herzig: Absolutely amazing. The Jewishness of Bethlehem though not emphasized much today and certainly not in Judaism but most every Jewish person knows that David was born in Bethlehem but they don't really think about it other than if they're taking a course in their synagogue or something like that. Chris Katulka: So King David was born in Bethlehem. And I think that's the reason. I mean God is ... all signs are pointing to Jesus being the davidic King, the Jewish king because part of being the Messiah is that you have to be what? A son of David. Chris Katulka: And so that's really important, the Jewish town of Bethlehem, right? Steve Herzig: It's so important. And I know you're going to talk about it but that's why the contrast between biblically a long time ago before Christ to now it's a complete turnaround as to what the mentality is concerning that part of the world. Chris Katulka: Well and let's not keep our listeners waiting. What's going on in Bethlehem today? Steve Herzig: Chris, it's crazy. In 1995 Yasser Arafat stood on the Church of the Nativity and declared that Jesus is a Palestinian. Steve Herzig: I remember seeing that and thinking no one's going to believe that. Well it's now years later and they have a whole conference about it and the Palestinians are still saying it and there's people very sympathetic to that. Chris Katulka: It wasn't too long ago I was in Israel and I was driving during a conference that I was at and I was down near Bethlehem, and Steve I saw just before you get into Bethlehem there is a huge red sign that's written in English in Hebrew and in Arabic. And it basically says if you are an Israeli citizen do not come in here, you are not allowed in and it's a danger to you to come into Bethlehem. Why is it a danger for Israeli citizens to go into Bethlehem today? Steve Herzig: It's a danger because the Palestinian authority oversees that. It's a danger because it's considered in that territory. And so we don't recommend, I personally would not recommend somebody going in there unless it's a large group. It's so difficult for me to wrap my hands around what they're doing to that part of the world. And in the article that I wrote as you know the Jewishness, the whole thing is Jewish. The prophet Micah is Jewish. Jesus is Jewish. Bethlehem was Jewish. The scriptures, Matthew was Jewish. And yet they have a Christ at the center was the theme of a theological gathering that was called Christ at the Checkpoint. Chris Katulka: Christ at the Checkpoint is a conference that they have yearly there isn't it? Chris Katulka: And what is that conference basically about in Bethlehem? Steve Herzig: The conference is actually talking about something that you and I have discussed off the record concerning social justice as it relates to a theology that is more work centered. It's sometimes called Dominion theology. Chris Katulka: Or liberation theology. Steve Herzig: Or liberation theology. It is so contrary to the biblical message of grace being saved by faith and it's grace that God gives to us through the death, burial and resurrection and instead looking at issues that are more political and making sure that the "evangelicals" and I put that in quotation marks in my article Chris. And I did so because I don't know the hearts of the people there, there probably were some born again people. But if your theology is based on a work system, if you think that by embracing this Christ at the Checkpoint and trying to help people and that's your theology I don't care which group you're in; Protestantism, Catholicism, Judaism, any works oriented system is outside of the sphere of what the Gospel really is. Chris Katulka: And Christ at the Checkpoint is not pro-Israel at all. I mean these are theologians. These are people that look at the Bible and they're saying hey look people who believe there's a future for Israel are left field, they're a little crazy. Christ at the Checkpoint is not even just about the Bible, it's very political and it's very anti-Israel. Steve Herzig: Very much so. Look, the conference website here's what it says. "We also", this is the conference. "also call upon evangelical Christians everywhere to join us in the hope that we can build a better world where goodness and truth reign free and where the love and fairness of God are common." Look, I would like that. I mean of course I would like that but that to masquerade as evangelical Christians. Look Chris you and I and Friends of Israel we want people to just get along. We want to help people get along. But that's not part of the Gospel message. The Gospel message is Christ died, rose from the dead, conquered sin and death in anyone that receives him. There's nothing we can do. And the idea of basing Israel, a country, a geographical location, basing that and saying that Israel is the oppressor is so contrary to the reality on the ground I just can't ... It upsets me Chris, I have to tell you. Steve Herzig: Just real quick Chris because this is emotional for me. I'm quoting from my article. "Jesus the Son of God was born of a Jewish maiden in a manger in Bethlehem of Judea. His birth was prophesied by a Jewish prophet and recorded by a Jewish disciple. Put that up as a template against what's going on in Palestinian controlled area." Chris Katulka: Thanks Steve for joining us today. Really appreciate it. Steve Herzig: Hey thanks Chris for having me. Steve Conover: If you're familiar with our ministry you know that we emphasize the need for solid biblical teaching and accurate analysis on the news of the day. One of the best resources for great biblical teaching that I know is the Friends of Israel's magazine Israel My Glory. Chris, some may not realize that Israel My Glory has been around since 1942 and has well over 150,000 subscribers. Chris Katulka: Yeah. I'll tell ya I travel the country speaking in churches. Churches in big cities and small rural towns and no matter where I go I always meet people who read our magazine and trust it as a resource for Middle East news and great biblical teaching. Steve Conover: To order your free one year trial subscription to Israel My Glory magazine visit foiradio.org. Compelling editorials, teaching about God's plan and promises to Israel, accurate analysis of Israel in the Middle East. That's Israel My Glory. And the next six issues are yours free, visit foiradio.org. Again that's foiradio.org. Chris Katulka: The other day I was leaving the airport after a great weekend speaking at our Prophecy Up Close conference in Vancouver. And as I stepped off the plane I noticed the airport started to put up Christmas decorations. Trees were all lit up, lights were shining, wreaths were being hung. And that's when it hit me that Christmas is right around the corner. Christmas is the celebration of God becoming man in the person of Jesus. And it's not about the gifts we give or the gifts we receive. It's really all about the greatest gift that was ever given to God's creation and that's the coming, the incarnation of Jesus. And as I was thinking about what I would say about our most recent issue of Israel My Glory something came to mind and it was this, God's timing. Jesus's birth wasn't this random event that nobody saw coming. The Gospels tell us that Godly people like Zechariah and Elizabeth, John the Baptist parents' and Simeon in the first two chapters of Luke were waiting and even looking for the coming of the Messiah. And don't forget about the wise men from the east who were queued by the star to come and find the newborn King in Jerusalem. They were waiting and looking for the coming of the Messiah. And the reason that they were waiting and looking is because like I said earlier Jesus's birth wasn't some random event. It was a birth that was promised and prophesied about in the Old Testament. The prophets Micah and Isaiah promised the birth of the king of Israel 700 years before Jesus was even a thought in Mary's mind. And even though God promised the coming of Jesus in the Old Testament even as far back as Genesis 3 still nobody knew exactly when. Nobody knew God's timing. They knew God's promise. But they did not know his exact time. Timing for God is everything. Now I'm reminded in the book of Esther when Haman, the Persian King's right hand man, sought to destroy all the Jewish people and just prior to his coming to power, God providentially made Esther, a Jewish woman, the Queen of Persia. And when word got to Esther that Haman is working to eradicate all the Jewish people of the Persian Empire, Esther was reminded by her family that maybe, maybe she was put in a place of power and prominence for a reason. Just listen to what Esther 4:14 says. It says this, "Don't imagine that because you are a part of the King's household that you will be the one Jew who will escape." "If you keep quiet" this is Mordechai speaking to Esther, "If you keep quiet at this time liberation and protection for the Jews will appear from another source while you and your father's household perish. It may very well be that you have achieved royal status, Esther, for such a time as this." I think another way to say it is God's timing is perfect. Because at the end of the Book of Esther God's people were delivered from destruction. And for thousands of years Jewish people and Christians have given God the glory even though his name was never once mentioned in the Book of Esther. There was plenty of opportunities my friends for God to bring Jesus to Earth to defeat Satan once and for all. The entire Old Testament is the longing for someone to come and fix the broken relationship that exists between man and God and Jesus could have stepped in at any moment. Jesus's life-saving power could have stepped in at any moment to deliver the Israelites during the Exodus time, during Judges, during the Kings. There are so many pregnant moments where God could have stepped in but he didn't. Why? Because God's timing is perfect. God's perfect timing was the moment Jesus was humbly born in the manger in the town of Bethlehem by a Virgin Mary just as the prophets promised. And God's perfect timing was when all the conditions were ripe for his people to be delivered and God's name to be glorified. And the Apostle Paul says this, "But when the fullness of time had come", this comes from Galatians Chapter 4, "when the fullness of time had come God sent forth his son born of a woman, born under the law to redeem those who were under the law so that we might receive adoption as sons. And because you are sons God has sent the spirit of his son into our hearts crying 'Abba Father'. So you are no longer a slave but a son. And if a son than an heir through God." It was just the right time for God to send his son into the world. During the time of Jesus's birth most of the known world at that time actually spoke one common language, it was the Greek language. So communicating the message of Jesus around the world into other cultures and tongues and people could be more effective than any other time in the past. The Roman Empire who ruled over much of the known world at that time had created peace throughout the Empire and established a road system that would provide a means for travel to the furthest most parts of the world where the Gospel could be spread. And think about this. When the Apostle Paul was about to be flogged for preaching the Gospel he cried out that he had Roman citizenship. And that Roman citizenship was his ticket to plead his case before the representative of the entire gentile world, Caesar himself. God's timing for Jesus' coming was just right. And this Christmas season as it approaches I know many of you may be wondering about God's timing in your life right now. Maybe you're dealing with loneliness or depression, maybe you're dealing with family issues this Christmas season. Maybe you have health concerns. Maybe you're wondering is God even there. Well if you open your Bibles you'll see one tiny thin little page that divides the old testament from the New Testament. And it's hard to imagine this but that thin little page represents 400 years of waiting, 400 years of Israel and the Jewish people waiting. Waiting for God to fulfill his promises. 400 years of tears. 400 years of sorrow. 400 years of wondering if God is even there. But in God's perfect timing he remained faithful. Listen to Zechariah, John the Baptist father's prayer about the coming of Jesus and the birth of his son John. Just listen to this. "Blessed be the Lord God of Israel" Luke Chapter One. "Blessed be the Lord God of Israel because he has come to help and has redeemed his people. For he has raised up a horn of salvation for us in the house of his servant David as he spoke through the mouth of his holy prophets from long ago that we would be saved from our enemies and from the hand of all who hate us. He has done this to show mercy to our ancestors and to", listen everybody this is important, "and to remember his holy covenant. The oath that he swore to our ancestor Abraham. This oath grants that we being rescued from the hand of our enemies may serve him without fear in holiness and righteousness before him as long as we live." My friends, this Christmas season I want you to know that God hasn't forgotten you. He hasn't left you in the wilderness. Instead he wants you and me, this is a reminder for me as well, to know that his timing is perfect. His timing is just right. So don't lean on your sorrows this season. Don't lean on your tears. Instead lean on his promises just as they did as they were waiting for the Messiah. You can hear it in Zechariah's voice as he's crying out to God "Thank you for remembering the promise that you made to us." Because the one who began a good work in you will perfect it until the day of Christ Jesus because you are where you are right now for such a time as this and God's timing is just right. Steve Conover: Thank you for joining us today. We appreciate Steve Herzig coming on the program to share with us his insights into the history and current climate in Bethlehem. And we want to take a moment now to mention that the Friends of Israel Today is a listener supported program. Would you prayerfully consider becoming a monthly supporter of this ministry? You can find out more at FOIradio.org or call and leave us a message on our listener line at 888-343-6940. Quickly again FOIradio.org. Or call us at 888-343-6940 and someone will return your call during regular business hours. Be sure to let us know where you listen when you call. Our host and teacher is Chris Katulka. Today's program was produced by Tom Gallione, co-written by Sarah Fern. Our theme music was composed and performed by Jeremy Strong. And I'm Steve Conover, executive producer. The Friends of Israel Today is a production of the Friends of Israel Gospel Ministry. We are a worldwide Christian ministry communicating biblical truth about Israel and the Messiah while fostering solidarity with the Jewish people. Start your FREE one-year trial today! Sometimes it’s hard to see what God is doing in the circumstances we are in, isn’t it? And the holiday season can be especially hard for those of us who are going through a difficult time. In our second segment, Chris shares with us about the perfect timing of God. From the unique way God used Esther to save the Jewish people in the Old Testament, to the perfect timing of Jesus’s birth, God has perfect timing! Be encouraged even when all looks grim or lost, God is at work! Love to listen to your messages, especially the one you mentioned where all seems hopeless, I see this in some of my closet family members, yet I know my God is still in control and His timing is Everything. Thank You for your encouraging messages, uphold you in prayers.